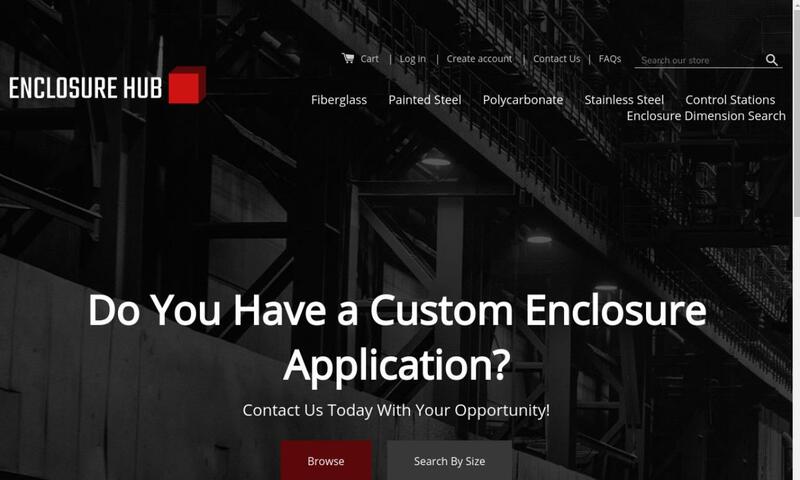 A reliable source for Enclosure Manufacturers information and a resource for accessing leading Enclosure Manufacturers and suppliers. Electronic Enclosures Electronic enclosures, also known as electrical enclosures or electronic enclosure boxes, are boxes that protect electronic equipment such as conduits, connections, and switches from the environment and from tampering. We are committed to excellence and our innovations in enclosure technology is an example of our commitment. Our unparalleled electronic enclosures are specialized for various tasks and our facility is ISO 9001:2008 certified & RoHS compliant. 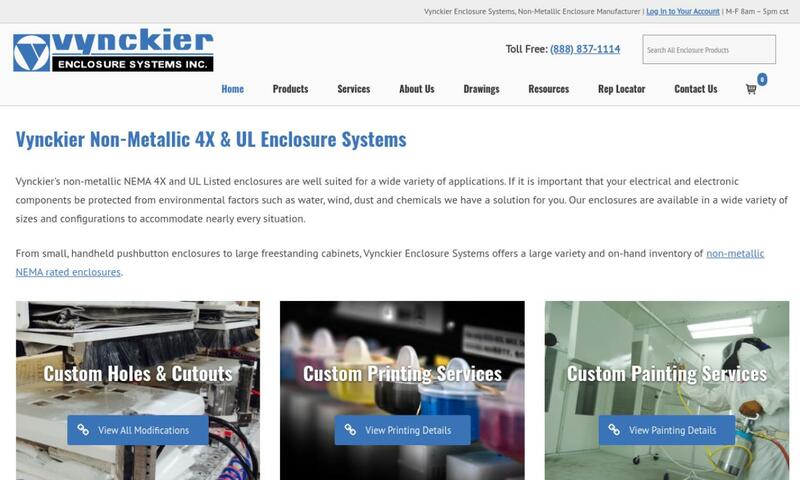 Vynckier Enclosure Systems is a premier provider of electronic enclosures, fiberglass enclosures, NEMA enclosures and plastic electronic enclosures. 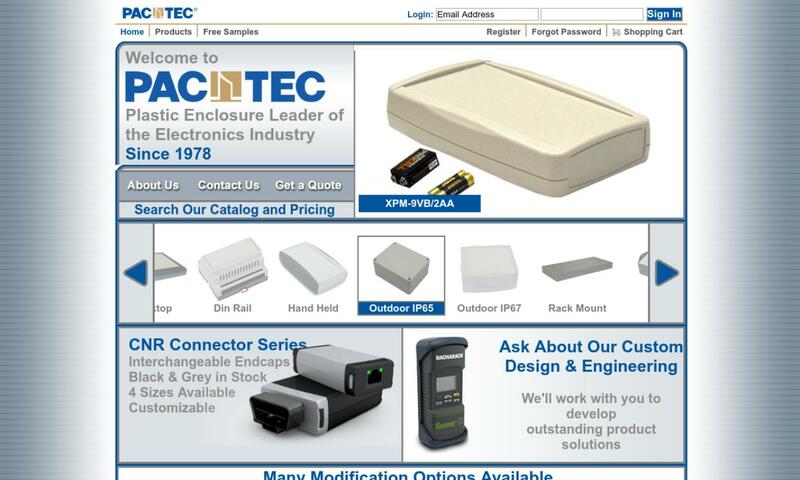 We design & manufacture plastic electronic enclosures & electrical enclosures. Choose from over 350 off-the-shelf handheld, desktop and wall-mount enclosures. Modifications are available to further meet your needs. 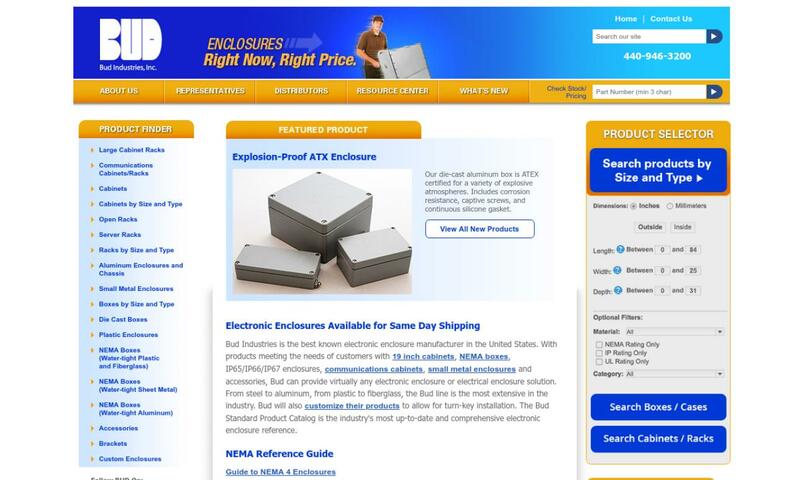 AD Products Co., a division of Scott Fetzer, offers the lowest pricing on quality electronic and electrical enclosure products, including NEMA enclosures, fiberglass and industrial enclosures and more. Modifications are available and stock orders ship same day. As the best known US electronics enclosures manufacturer, Bud Industries, Inc. has the most complete line, including 19 inch cabs, IP65/IP66/IP67 and communication options and related accessories, all of which are available in a range of sizes and materials. Not only do electronic enclosures protect their contents from pollutants or moisture, they also shield the internal equipment from electromagnetic interference, or EMI, that would disrupt the efficient performance of the circuitry inside the enclosure. Electronic enclosures house a wide range of electronic equipment to protect them from damage, contaminants, and interference. They are a standard component in most industrial and manufacturing settings because of the sensitive and important nature of electrical systems and wiring. Sometimes referred to as electrical cabinets, electronic enclosures are widely used in the medical, automotive, and agricultural industries to protect equipment and instruments but can be found in any electronic application. Electronic enclosures were invented shortly after we began using electricity. Engineers designed the first electronic enclosures in order to shelter cut-outs, an early switch type featuring an insulated T-shaped hammer and copper bars. Initially, people installed cut-outs without any enclosures. They simply mounted them onto a surface and held them in place with fasteners, like self-tapping screws or bolts, with their live wires completely exposed. Once people discovered that these live components were both potentially dangerous and susceptible to damage, they started encasing them in wooden enclosures, called cut-out boxes. After that, manufacturers also began housing switchboards, which also contained live copper parts, inside wooden enclosures. Wooden enclosures worked well for a while, and when people began getting electricity installed inside their homes, manufacturers applied them again. Quickly, though, homeowners found wooden enclosures to be inadequate. This was because, inside the wooden enclosures, the live wires could overheat. If one of these overheated wires came loose, as they occasionally did, they could easily start a fire. To remedy this, engineers tossed out the wooden enclosures and replaced them with flame retardant metal electronic enclosures. Since the early days of enclosures, their applications have grown exponentially, as have the ways manufacturers design them and the materials they can use. Because of the way we continue to rely on electronics, electronic enclosures are bound to only become more prevalent. 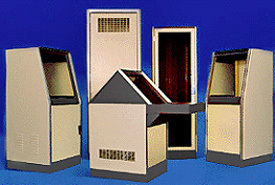 Mounted enclosures, or mounted cabinets, are very popular. As their name implies, mounted enclosures are designed to be wall mounted. As such, they feature holes at the bottom or back of their housings, through which users can pass fasteners like screws to secure them. Standardized rack mount enclosures accommodate multiple 19-inch-wide equipment modules. They feature protruding edges. At those edges, users can fasten individual modules to a frame. Manufacturers typically make standardized rack mount enclosure frames from steel or aluminum. They do so in order to take advantage of both these metals’ strength and load-bearing properties. Manufacturers usually make these rectangular enclosures themselves from plastic or metal, particularly steel and aluminum. In this case, manufacturers choose these materials in order to help enclosures resist corrosion, and to shelter their contents from weather and vandalism. Also, many models have a door that can be shut and locked. Professional audio equipment, computer servers, and other electronics are stored inside rack mount enclosures. Computer enclosures are those electronic enclosures that manufacturers build to hold computers. These enclosures often double as rack mount enclosures. Inside the enclosures, which manufacturers typically make from steel or aluminum, the computers are safe from the elements. While enclosures are not inherently resistant to EMI (electromagnetic interference), manufacturers can add an EMI shield coating to make them so. Electronic instrument enclosures are enclosures that manufacturers build to hold a wide variety of electronic instruments used in a wide variety of settings. For example, instrument enclosures can be rugged; some are designed specifically for use in demanding situations where explosions, earthquakes, or tornadoes may occur. These enclosures are often made from die cast iron or aluminum and range from small rectangular metal boxes to circular enclosures that can protect head-mount style instruments. NEMA enclosures are those enclosures that are certified by NEMA, more formally known as the National Electronic Manufacturers Association. There are thirteen different types of enclosure NEMA ratings. They are defined by whether they are to be used in hazardous or non-hazardous applications, whether they are to be used indoors or outdoors, and what types of elements and conditions from which they can protect electronics. Some of the most common ratings include Type 1, Type 3R, Type 4, and Type 12. Type 1 NEMA enclosures work best indoors, in non-hazardous environments. Mostly, they offer a degree of protection against contamination by dirt. Type 3R NEMA enclosures are also designed to work in non-hazardous environments, but they are suitable for the outdoors. There, they can protect against the damage associated with exterior formation of ice, snowfall, rainfall, and sleet. Type 4 NEMA enclosures are more versatile than their predecessors. While they still require a non-hazardous environment, people can use them indoors or outdoors. In addition to damage from exterior ice formation, snowfall, rainfall, and sleet, they protect against damage from windblown dust, splashing, and water from a hose. Type 12 NEMA enclosures work indoors, where they protect electrical/electronic components from falling solid foreign objects (falling dirt, fibers, circulating dust, lint, etc.) and non-corrosive dripping liquids. Project enclosures are empty enclosures that students or hobbyists use to hold the electrical items and electronic items that they have made. Stainless steel enclosures offer corrosion resistance, heat resistance, and durability. They work best with electrical items that create an overabundance of energy. This is because the stainless steel can work as a heat exchanger; when presented with a high degree of energy, it will absorb it and transfer it as heat. Aluminum enclosures are most often made from diecast aluminum. They offer the benefits of malleability, durability, electrical conductivity, thermal conductivity, and lightness. Diecast aluminum enclosures are most common indoors, where they are less likely to be exposed to moisture, to which they are not particularly resistant. ABS enclosures are made out of acrylonitrile butadiene styrene, a thermoplastic more commonly known as ABS. These plastic enclosures are known for their high impact resistance, shock absorbency, excellent electrical insulation abilities, and their light weight. While they are popular for many different applications, ABS enclosures are most common as enclosures of handheld and pocket-sized electronics. Polycarbonate enclosures are made from the plastic of the same name, polycarbonate. The biggest advantage of polycarbonate enclosures is the fact that they insulate electronics from heat. For that reason, they are especially common with electronics used in environments with low temperatures. Manufacturers can mold polycarbonate enclosures to be exceptionally compact and small. Fiberglass enclosures offer the advantages of chemical resistance, heat resistance, corrosion resistance, impact resistance, high tensile strength, and superior electrical properties. Most often, customers purchase fiberglass enclosures for use around moisture, salt, chemicals, corrosiveness, and for outdoor use in general. Electronic enclosures are frequently rectangular and box-like; other styles are round or have sloping sides. Often, they feature a panel or panels to make them accessible. Electronic enclosures range in size from one square inch that fits a simple pushbutton assemblage to an entire room that contains large computer networks and wiring. Manufacturers usually make electronic enclosures from sheet metal, like stainless steel sheet or aluminum sheet. However, they frequently also use composites like fiberglass and high strength polymer plastics. In addition, depending on the application, manufacturers may build the enclosure using thicker metal for the frame, and/or encase it in reinforced plastic, carbon fiber, or Kevlar. Manufacturers choose electronic enclosure materials based on the application, and what qualities it requires to succeed. Examples of such qualities include corrosion resistance, thermal insulation, spark resistance, explosion resistance, low temperature resistance, durability, security, etc. Manufacturers can custom make electrical enclosures for a precise fit, or they can ship products made based on one of thousands of existing standard enclosure designs. They often draft their ideas with the help of computer software like Protocase Designer. When designing custom enclosure products, manufacturers must decide on details like enclosure size, construction materials, mounting type, orientation (vertical or horizontal), and security. All enclosures are basically boxes, so they have very few distinct components. However, manufacturers can custom design them so that they have a variety of useful features. For example, handheld enclosures can have soft ergonomic grips and a battery door. Many enclosures simply snap together. Meanwhile, others use a lap joint or tongue and groove construction for a tight seal to keep out dust and water. Also, manufacturers can add features like locking mechanisms, LCD screens, a warning sign (to alert those nearby to the sensitive and potentially dangerous equipment inside), ventilation fans, lids, removable panels, access points, vents, recessed tops to accommodate labels and keypads, and more. 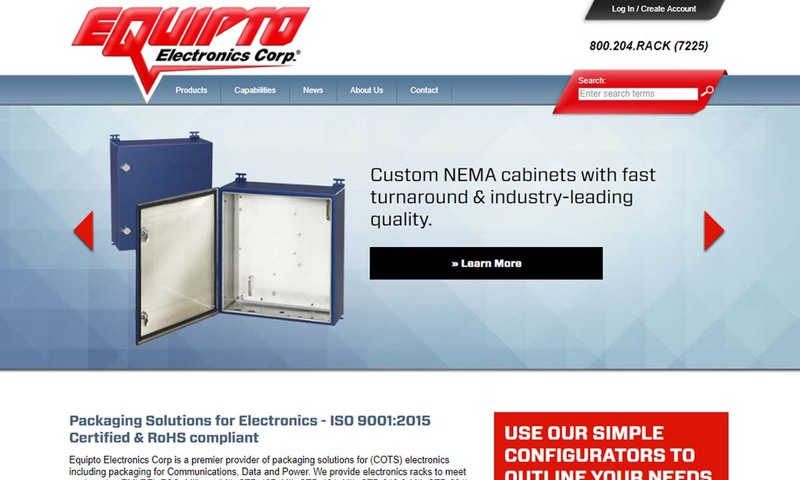 One of the most important standards that you should look at when purchasing electronic enclosures is its NEMA type. As we mentioned earlier, this refers to the grading assigned to an enclosure by the National Electrical Manufacturers Association. In the United States, other prominent organizations that put out/enforce safety and compliance standards related to electronic enclosures include NIST (National Institute of Standards and Technology) and OSHA (Occupational Safety and Health Administration). The main global standards organizations that issue electronic enclosure regulations include UL (global company headquartered in US) and IEC (International Electrotechnical Commission). In addition, many individual countries put out their own sets of standards. To find out which standards you should make sure that your electronic enclosures meet, talk to your industry leaders. If you are looking for an electronic enclosure, we recommend that you consult with an electronic enclosure manufacturer that is experienced and has your best interests in mind. To help you be successful, we have gathered the names and contact information of several electronic enclosures manufacturers that we trust. You can find their info, along with profiles, towards the center of this page, sandwiched in between these information paragraphs. We believe that one or more of these manufacturers will be able to help you succeed.  To determine which manufacturer is the best fit for you, we suggest that you begin by making a list of all of your specifications and requirements. Do not forget to include the nitty-gritty details like your budget, your delivery date deadline, and your post-delivery support preferences. Once you have written down all of your specifications, you can use them to quickly discern which manufacturers do and which manufacturers do not have the potential to serve you. From our list, pick three or four top contenders, then reach out to each of them. Either send out a quick request for a quote or call them. When you get a chance to correspond, go over your application in detail with each of them, using your specifications list as a conversation guide. After you have spoken with representatives from each supplier, compare and contrast your conversations. Determine which one offers not only the best prices, but the highest quality customer service. Once you have narrowed your field of candidates down to one, contact your pick and get started. Good luck!